Black Friday found me venturing out doing a little real life shopping vs online shopping. It was actually pretty fun, especially considering how many fun, little items we came across. One of the hardest gifts to find is "stocking" gifts. Yet, everything time I turned around, there were tons of the cutest mini toys, bags, games that my kiddos would LOVE and immediately made me think STOCKING! Over the next few weeks, I thought I'd share some of the cool things found while shopping that would make perfect stocking stuffers or gifts for all. 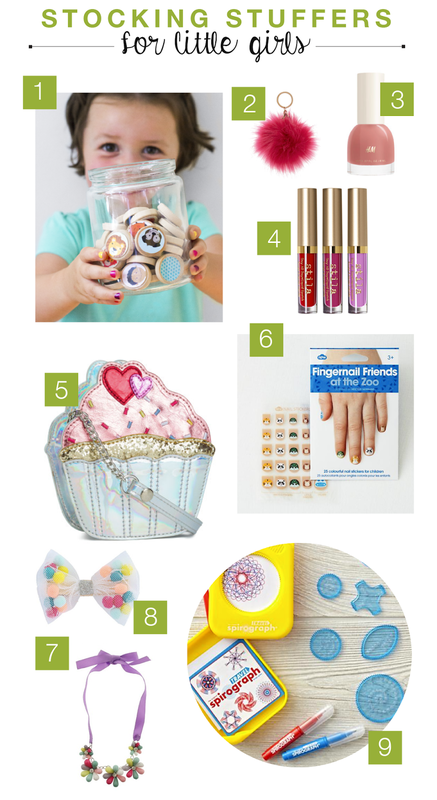 To start, let's kick it off with stocking stuffers for little girls. My 4-year-old daughter has asked for three things this Christmas - lipstick, a watch and make up! Yes, her requests. She thinks she's 16. Over the last couple years I've unintentionally ignored the girly side of her, so this year I'm shooting for all things sparkly, pink and girly. Really it's not hard when she requests lipstick. 01 Olliblocks : Matching - One of my favorite online shops is Caravan Shoppe, curated by Alma Loveland. Everything is gorgeous and these matching tiles are colorful, fun and creative. All you need are artwork tiles + the $7.00 digital file + a little glue. DIY those babies, toss them in a cute little bag and voila! the cutest stocking stuffer EVER. 02 Pom-Pom Key Ring - Bags & backpacks are totally the "thing" in our house. Both of our kiddos love toting their toys around in any bag. Little accessories add tons of personality to plain bags (which we have a few of). Plus, fuzzy. Plus, colorful. Winning all around. 03 Nail Polish - Nail polish is a much requested item in our home. I recently started paying to have my nails done, which means I rarely paint mine at home. Sadee loves to do this, but spending money on expensive polish that lasts only a couple days on little hands is haaaaard! H&M really nails it (no pun intended) when it comes to inexpensive, but quality items. Their polish comes in a variety of colors and I wouldn't be heart broken if said nail polish gets accidentally spilled by wiggly, little bodies. 04 Stilla Lipstick - Okay, okay... before you tell me I'm CRAZY for buying my child STILA lipstick - let it be known that Nordstrom Rack carries discounted Stila Lipstain. Sadee LOVES lipstick and I rarely let her wear it. So, I was determined to find something that was 1) light and 2) wouldn't wipe off immediately. That way I would be okay saying "yes" to the daily request. The set linked is a holiday kit, which means you get 3 colors for only $20 versus 1 color for $24. At Nordstrom Rack they were $6 each. Crossing my fingers we love them on our child as much as I love them. 05 Cupcake Purse - Cupcakes + purses + shiny = perfection! This little side bag would be perfect for carrying around that much loved lipstick. 06 Fingernail Stickers - As mentioned earlier, nail painting is not listed among my skills. When I saw these animal nail stickers I immediately thought YES!!!! Definitely excited to test these bad boys out. 07 Flower Necklace - Jewelry is always a good idea! Sadee originally requested earrings, but we haven't braved that piercing-right-o'-passage quite yet. When she realized that, she immediately decided necklaces would be a good alternative. Necklaces are probably the only thing that I say yes to on a regular basis when it comes to little girl fashion choices. Why not stock up on cute ones?? 08 Pom-Pom Hair Bow - Bows are a necessity around these parts, especially now that hair-doing is becoming a real power struggle. Sadee knows that as long as she has a bow in her hair, mom is happy. She enjoys choosing bows to match her outfits. This colorful + pom-pom bow is sure to be a hit. PLUS it comes in a set with a silver, sparkle barrette. 09 Travel Size Spirograph - This year I've been focusing gift buying on activities that allow my children to play and create individually + ones I'm happy to say yes to. Playdoh, for example, does not fit in this category. While browsing, I remembered the much loved Spirograph from when I was a kid. Then finding a TRAVEL size one, I mean come on! Cue all the nostalgic, mini cuteness heart eyes. We'll probably be buying the travel + normal sized ones.